Millions of children suffer from anxiety, which can be extremely limiting, causing kids to miss school, opt out of activities with friends, and refuse to speak or participate in a variety of situations. Furthermore, children who are diagnosed with anxiety or brought into therapy often feel embarrassed about not being normal." Focusing on the problem of anxiety can stress kids out and make them feel ashamed. But when the focus is on their strengths and their vivid imaginations, children are empowered to face their anxiety head-on. 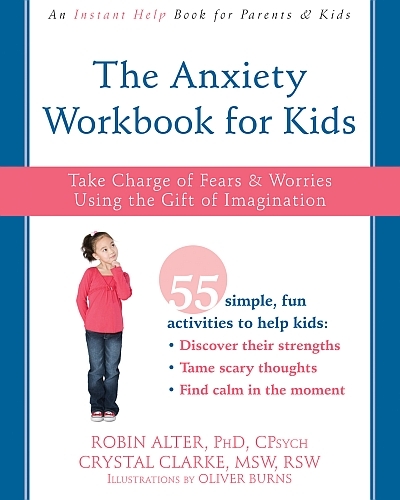 The Anxiety Workbook for Kids is a fun and unique workbook grounded in evidence-based CBT and designed to help children understand their anxious thoughts within a positive framework-a perspective that will allow kids to see themselves as the highly imaginative individuals they are, and actually appreciate the role imagination plays in their anxiety. With this workbook, children will learn that, just as they are capable of envisioning vivid scenarios that fuel their anxiety, they are capable of using their imagination tomove away from anxious thoughts and become the boss of their own worries. With engaging CBT-based activities, games, and illustrations-and with a focus on imagination training and developing skills like problem solving, assertiveness, positive thinking, body awareness, relaxation, and mindfulness-this book will help kids stand up to the "worry bully" and harness the power of their imagination for good. Robin Alter, PhD, CPsych , received her undergraduate degree from Skidmore College in Saratoga Springs, NY. She received her master's and doctoral degrees from the University of Florida in Gainesville, FL. She has been working in children's mental health in Toronto, ON, Canada, since 1980. Alter has been employed by two of the largest children's mental health centers in the Toronto area for over thirty-four years-the Hincks Dellcrest Children's Centre and Blue Hills Child and Family Centre. She also works with Anishnawbe Health Toronto, providing fetal alcohol assessments for the people of the First Nations community. She has taught psychology at York University and maintains a private practice with Alter Stuckler and Associates in Thornhill, Ontario. She is trustee with the Psychology Foundation of Canada. Alter gives many public lectures to parent groups, teachers, and principals, and has been on numerous radio and television programs talking about children's mental health issues. She is author of Anxiety and the Gift of Imagination and is the anxiety expert for the ABC's of Mental Health website. Crystal H. Clarke, MSW, RSW , received her undergraduate social work degree from Memorial University of Newfoundland in Canada. In addition to her employment as a social worker with child, youth, and family services in the city of St. John's, NL, Candada, Clarke supported foster families across the province from 2007 to 2009 through her involvement on the board of the Foster Families Association of Newfoundland and Labrador. Clarke received her master's degree in social work at the University of Toronto, where she specialized in clinical practice with children and families, as well as completed the collaborative program in addiction studies. In 2009, Clarke became involved with the Hincks Dellcrest Centre, one of the largest children's mental health centers in Toronto, where she continues to be employed as a child and family therapist. Additionally, Clarke maintains her own private practice, Clarke Psychotherapy, in Toronto. Clarke was appointed as an adjunct lecturer for the Factor Inwentash School of Social Work at the University of Toronto in 2015. She is also committed to continually expanding her own field of knowledge in the area of mental health through her studies at the Toronto Institute for Contemporary Psychoanalysis, where she has completed the psychoanalytic psychotherapy program, and is continuing to pursue the four year post graduate training program in psychoanalysis.